Simultaneously enhance and protect your fireplace area using the Panacea Black Three Panel Arched Firescreen with Doors. The classic shape, black color, and metal construction of this unit make it a wonderful addition to any hearth, while keeping sparks safely away from your family or floor. The gently arched, center panel creates a timeless silhouette, and two, 13" wide doors here open in the center for tending to the fire easily. Two black knobs and a magnetic closure keep the doors closed when adding logs is not needed, and 0.25", diamond shaped mesh throughout the robust metal frame keeps embers from escaping the fire box. Two rectangular, 12" wide panels flank the center panel, and their hinged connection allows them to be placed at a wealth of angles, to accommodate several sizes of fireplace openings. Attach the two included, 2.5" long support bars to the base of this screen for extra stability, keeping it from tipping forward. Its all metal body remains hardy for use season after season, and the black color brings an elegant look to your home. 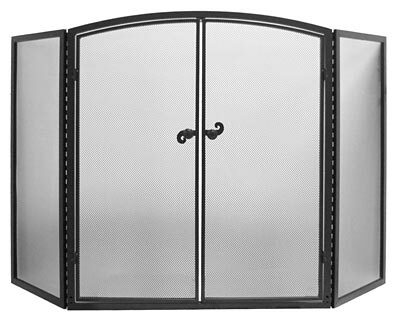 Easily tend to your fire while safely enjoying it using this Black Three Panel Arched Firescreen with Doors.